The IVEA was designed to pivot 360 degrees for easy navigation in tight spaces. 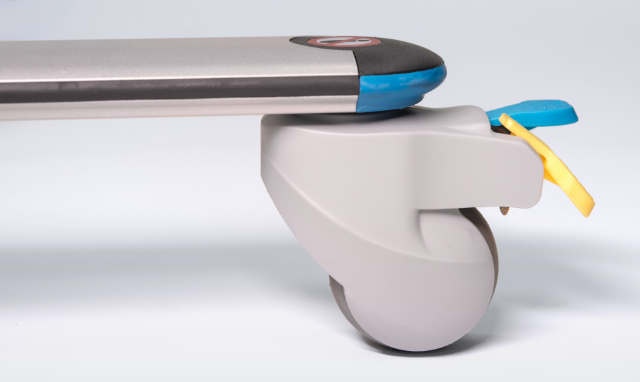 The new SureTrek™ Caster System offers caregivers greater control with the option to enable the equipment’s tight-turning capability or to lock the rear casters in a forward-tracking position. Easy-lock pedals secure the IVEA in place. Single-track pedals lock rear casters in forward-tracking position. 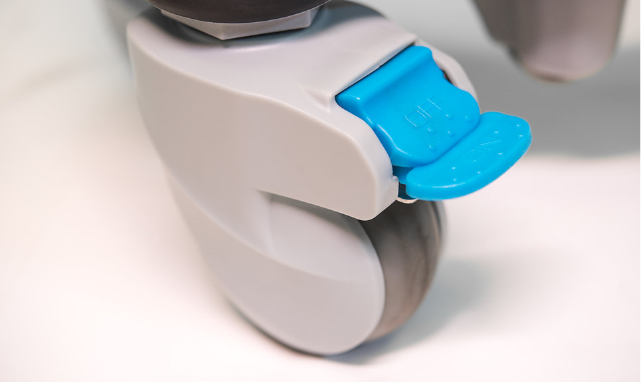 Wide, sturdy wheels roll smoothly and quietly over thresholds. Learn More About the SureTrek Option. Every clinician knows that early and frequent patient ambulation can lead to better outcomes. A patient’s physical function can begin to deteriorate as early as day two of a hospital stay, and bed-bound patients are more likely to develop hospital-acquired conditions that can increase length of stay. But patients who are fearful of falling might be reluctant to walk, even when they understand the benefits of ambulation. The IVEA can help ease these fears with an ergonomic design developed to promote safety and instill confidence. 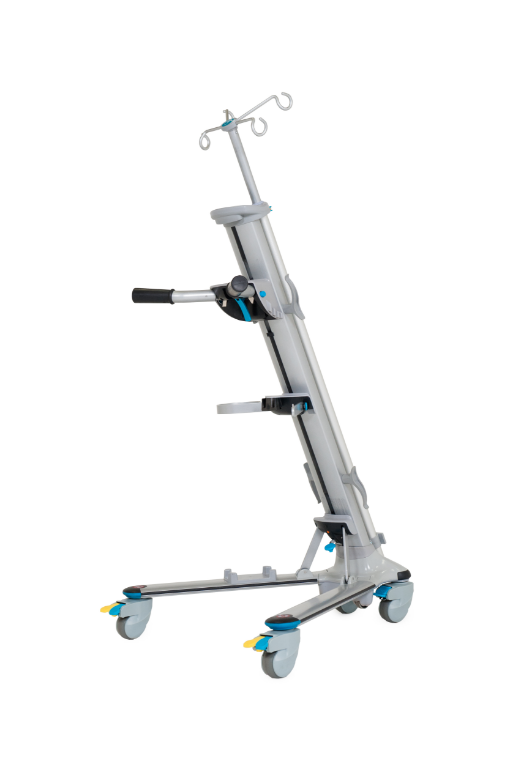 The IVEA’s unique V-shaped base helps encourage the patient’s natural gait and proper posture. The patient’s supportive equipment is organized out of the patient’s way to eliminate tripping hazards. And unlike an IV pole, the IVEA actually becomes more stable as more weight is placed on it. 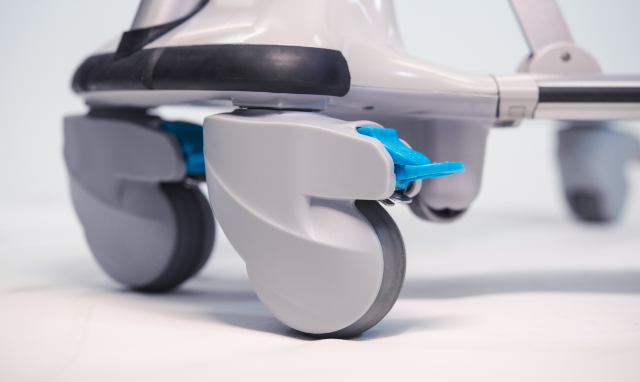 Now, with the SureTrek™ system, caregivers have the option to lock the rear wheels in a forward-tracking position, which may give patients even more confidence to walk sooner and farther. Under the pay-for-performance model, patient satisfaction is more important than ever. Patients love the IVEA, and now, with SureTrek™, they can feel even better about walking their way to recovery. Nurses and other caregivers have some of the highest injury rates of any profession. The IVEA was designed by clinicians to help reduce patient falls and also protect caregivers from overexertion injuries related to those falls. Too many caregivers are suffering debilitating, even career-ending, injuries related to patient handling. The IVEA allows the caregiver to focus on the patient rather than on the equipment. And with proper use, the SureTrek™ system delivers enhanced control that can make both the patient and caregiver feel safer. SureTrek™ is easy to use and allows caregivers to select the option that’s best for the patient. Nothing can replace a caregiver’s good judgment, but when your patient’s are ready to move, the IVEA with SureTrek™ can give them the support and confidence they need to go far! To purchase SureTrek™ casters for your IVEA units, contact your IVEA sales rep, give us a call at (970) 472-5323, or send us an email at info@iveamobility.com. For installation instructions watch our quick video. This equipment has a great wheelbase for walking. It's very steady and glides well even on carpet.